Roseau, Dominica – April 1, 2008………The Government of Dominica appreciates the patience and support of persons who use the road in an area known as Cabanis- leading to the villages of Fond Canie, Laudat, Trafalgar and Wotton Waven. Major excavation work on that section of road, heavily compromised by the heavy rains and landslides caused by the passage of Hurricane Dean last year started two week ago. 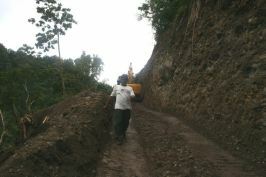 The works are being undertaken by the Ministry of Public Works and Infrastructural Development. The intention is to widen the road by a further 20(twenty) feet for the safety and comfort of road users. During the duration of the works on the road, persons wishing to travel to the Valley must use the alternative route- via Copthall/Wotton Waven. It is anticipated that the works will take another six weeks to reach completion barring unfavourable weather conditions and so the Government is appealing to users of the road to be patient. Meanwhile Government has deployed workers on the Copthall/Wotton Waven route to significantly improve the condition of the road in sections, placed culverts and in some areas has built triangular drains. The Government expects the Road Improvement and Maintenance Project (RIMP) to complement the road works now taking place at Cabanis. The RIMP project, funded by the Caribbean Development Bank will upgrade and rehabilitate the roads leading to the major tourist attractions in the Roseau Valley, including Bath Estate to Trafalgar, Laudat to Trafalgar and the St. Aroment Spur Road. Work on this project is expected to commence in the second quarter of this year.